Coach House Books, 9781552453759, 220pp. We know how Simone met the man who will become, for a time, her fourth husband. We know what she does (artist), her age (older than she looks), her friends (a veritable menagerie), her habits (frustrated homebody). What remains to learn are the things she still doesn't fully understand herself, like her role in the affair of the Port Merveille diamond, also known as the Supreme Orchestra. 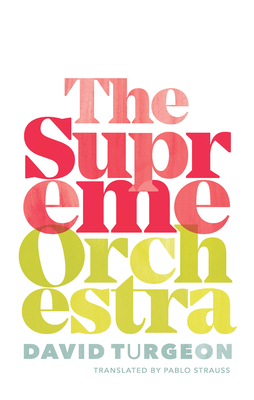 The Supreme Orchestra is many things at once: a geopolitical thriller, an art-world expos , a digressive social study, a mischievous parody. In the line of master ironists like Walser and Nabokov, with a comic timing reminiscent of Herg and a Flaubertian infatuation with le mot juste, David Turgeon has created an oeuvre like no other in Quebec's fertile literary scene.